Plague Inc: Evolved is coming to Playstation 4...next week! 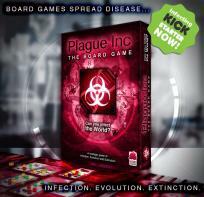 Board games spread disease! Plague Inc: The Board Game has infected Kickstarter today with a $34,000 goal and has already raised 30% of that in the first hour! Help us infect the world now! Custom Scenarios and Random Name Generator is out now on iOS! Coming soon to Android. Loads of new scenarios made by Plague Inc. fans. Players will be able to infect the world with werewolves, plants, xenomorphs, cats, fridges, the four horses of the apocalypse - you name it, it’s probably there!